It’s not joke that it is already April! The year is flying by and each week we are having more and more fun. As the Easter Holidays are literally around the corner, come have a look at what we have planned. We would love to have you join us for a Stable Day or a Groom and Ride, I do need let y’all know that all our Pony Playtimes are now FULL and we will not be able to take any further bookings. The next Pony Playtime is the end of May. Our Handlers are going to have a fun Pizza & Paint day on the 8th. It is time for a spring clean and spruce up, so they are going to have a blast with the paint brushes and some of them are going to get our gardens in order with new, pretty flowers. When they are done, I know that Sunshine will look blooming marvellous! As promised, Sunshine is streaking forward into the 21st Century with the help of our IT Man, Andrew. He has worked exceptionally hard and produced for us an ON-LINE SHOW REGISTRATION. This means you can register for a show without going via The Office or the post. Your entry will magically appear in my show box and can’t be lost. You will need to pay the correct entry fees when you collect your number, and you can pay using cash or card (no AmEx please). We also will continue with a hard copy Show Brochure which corresponds to the on-line information and does contain 3 entry forms and a map to get to us. If you would like a copy of one, please send me your name and address so I can post one to you. All jumping shows are open to entry on the day, but dressage must be pre-booked. We have also created a VIDEO page which has many of the videos of the various events we host each year. We welcome you to have a peruse of our activities. We would love to have you join us and this will give you a clear idea of what we do! 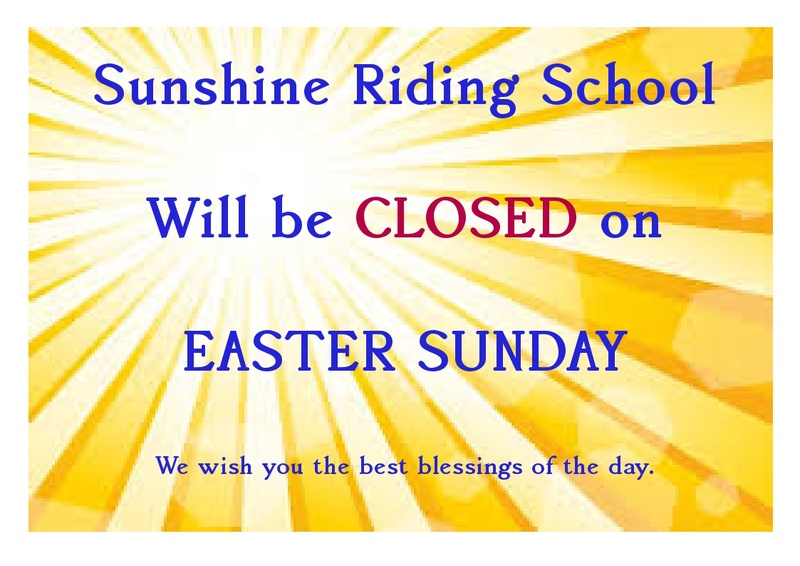 We would also like to remind you that Sunshine Riding School is CLOSED on Easter Sunday. We look forward to seeing you on Saturday the 20th for our St. George and The Dragon Showing Show and on Easter Monday for our Easter Dressage Show! To book in, please contact the office on 01582 505040 or by email at sunshineridingschool@gmail.com . See you soon! Call on 01582 505040 or contact us at sunshineridingschool@gmail.com for your place! 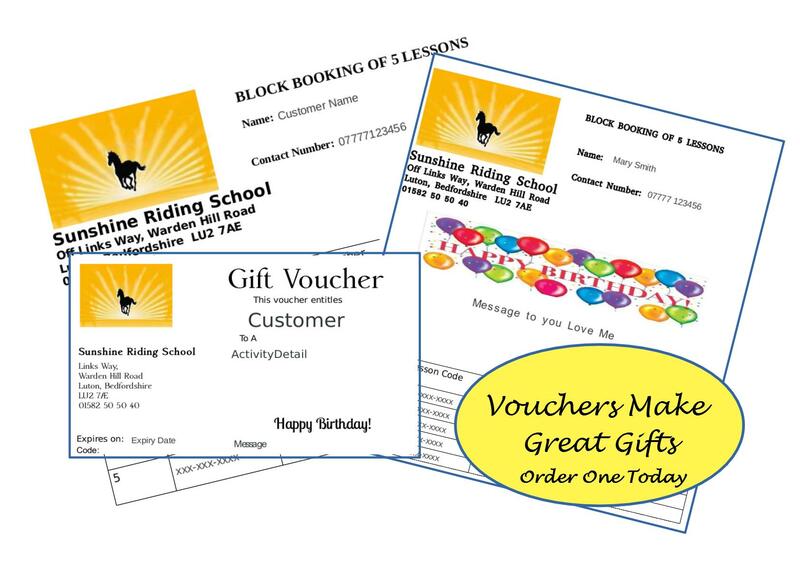 Call the Office on 01582 505040 or send us a message on Facebook @ridingatsunshine to book your session. Easy to order and pay via PayPal. Click HERE for a quick link. Lessons have started fully again with the weekends beginning at 9am. We are having to split our Novice Class into an Upper and Lower Group. It is very exciting to have as many Novices as we have, but some are almost ready to go up to an Intermediate Class and some have just moved up. The Upper Novices will be at 9am with Kimberly and the Lower Novices will be at 2:15 each Saturday & Sunday. The work we are doing will prepare the riders for participating in Interdressage which will be filmed on the Sunday nearest to the 20th of the month. Interdressage is a British Dressage recognised internet competition where the tests are videoed and then set to Interdressage for judging. Like all competitions, you will receive comments and, if it all goes well, a rosette. Kimberly has done these competitions previously and knows what is expected and what is required. If you are interested in participating, please speak to Kimberly in the Office who will provide you with the appropriate Test. The Jumping team will again be going out to Bury Farm on alternate Wednesdays for Clear Round Jumping of heights up to 95cm. We are also looking at attending the local non-affiliated shows at Caddington or Twin Trees in the late spring and early summer. Our own special jumping shows, the June Jump and the Accumulator Cup will go ahead on the last Sunday of July and July respectively. Please speak to Fiona or Kimberly if you are interested in participating in any of these. Often treated like the poor cousin of the equestrian world, both Ridden and In Hand Showing are a lot harder than one would think. We are looking for those of you who would like to try this discipline out and show either ridden or in hand. If you are interested, please let Fiona or Kimberly know. 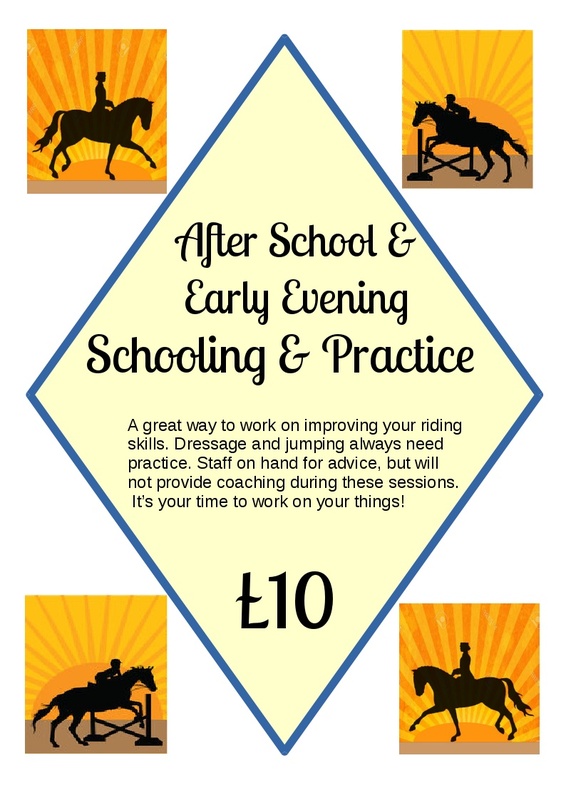 Sunshine Riding offers our regular riders the opportunity to practice what they are working on in their lessons or to prepare for a show by offering After School and Early Evening Schooling Sessions. Unlike a lesson, there will be no teacher present to correct what you are doing, but you will have supervision. These sessions last 1 hour and must be booked in the office at least 24 hours in advance. Schooling is a great way to move forward and to get the most out of your lessons for both children and adults. Don’t forget our Shop when you are looking for that unique gift for your Equine Minded Friend. This might not seem important or necessary, but in fact it is one of the most vital skills in the equine world. Being able to lead 1 or 2 horses in walk and trot, open and close gates while holding a horse, controlling the animal from a ground position through a obstacle course is not just a competitive sport but a daily occurrence for horse people the world over. Anyone who wishes to loan a horse during a school holiday needs to know this skill. So we are teaching it. Riders who are Novices and above must know this skill. So we are teaching it. Pony Club, British Horse Society Levels, NVQ Levels 1 & 2 require and assess this ability. So we are teaching it. Oaklands, Shuttleworth and Hadlow Colleges all require In-Hand training. So we are teaching it. We believe at Sunshine that riding lessons are more than just the work you or your child does on the horse’s back. Riding lessons are about developing a complete understanding and skill base for handling horses. It develops coordination and confidence. It makes the time spent with the horse so much more full and enjoyable. We aren’t making riders, we are making Horsemen and Horsewomen. Sunshine Riding has an active and educational volunteering programme. Volunteers are important to us, so we respect what they have to offer us in the way of time, energy, and experience. In return, we will train them in horse care, horse handling and riding. Sunshine has stringent Workplace Health & Safety guidelines as well as a full Sickness Policy and Grievance Procedure. An Adult Volunteer who would like to work on the weekends or be part of weekday lessons must under take a DBS. We ask that a Volunteer would be willing to work at least a ¾ Day; for example, 10am to 4pm. We ask that a Volunteer agree to work that day(s) for a minimum of 6 weeks. We ask that a Volunteer is willing to follow the Staff Code of Conduct. What can the Volunteer expect of Sunshine? We will treat you with respect and help you as necessary. We will teach you the basics of horse care: feeding & water, grooming, hoof care, stable care (mucking out), proper tying up, and spotting when a horse is unwell. We will teach you the basics of horse handling: how to approach a horse and put on a head collar, how to lead a horse in and out of a field, how to walk with a horse, how to trot with a horse, how to handle a difficult horse. We will help you to start riding or to continue to ride. This is an earned privilege and will granted after every 5th visit for the first 6 months. After that point, riding will be included as schooling not lessons. For more information about this, please speak with Kimberly. 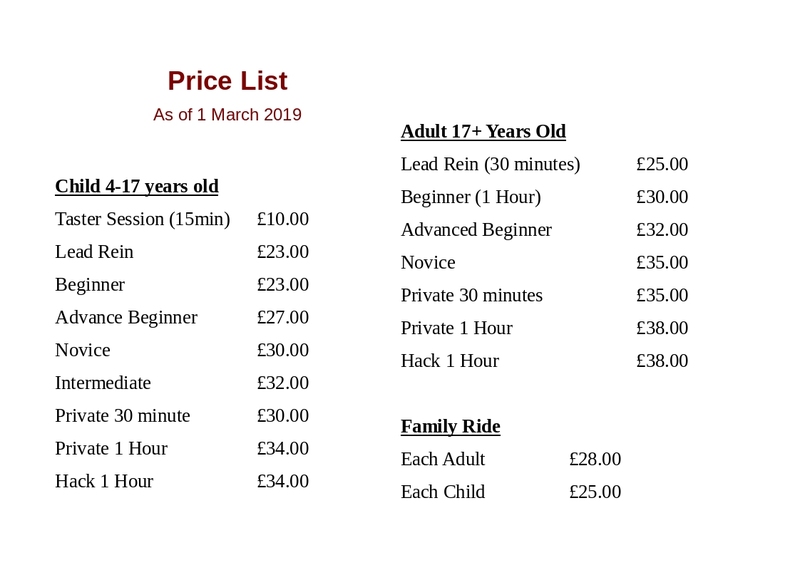 Sunshine Riding School is licensed by Luton Borough Council acting under the powers conferred by the Riding Establishments Act 1964 and 1970. Sunshine Riding operates a blanket 24 Hour Notice for cancellations. Any cancellations in this window will incur a £20 charge payable immediately on your debit or credit card. Refusal of payment will result in suspension of riding.